Lieutenant Colonel Jay Kopelman won the hearts of readers everywhere with his moving story of adopting an abandoned puppy named Lava from a hellish corner of Iraq. He opened the door for other soldiers to bring dogs home, and in From Baghdad to America, Kopelman once again leads the pack with his observations on the emotional repercussions of war. Here, for the first time, Kopelman holds nothing back as he responds to the question, Why did you save a dog instead of a person?” The answer reveals much about his inner demons and about the bigger picture of Operation Iraqi Freedom. He talks about what it’s like to return to the States and examines the shocking statistics to come out of Iraq: Depression, suicide, alcohol abuse, and broken relationships are at record highs for the men and women who serve there. Kopelman credits Lava with helping him to endure combat and the pain of war, as well as helping him deal with the surprising difficulties of returning to everyday life. Civilians have a hard time understanding what being a Marine means, and the adjustment to living among them is hard for these soldiers. This book attempts to shed light on that for all readers. 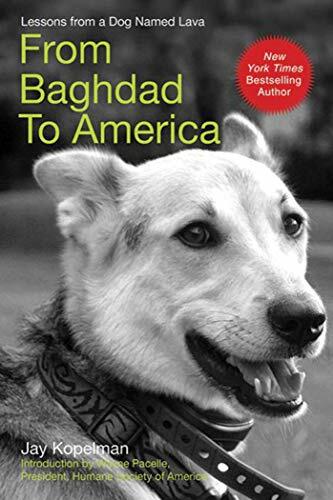 Jay Kopelman, a retired Marine Corps Lieutenant Colonel who served in combat in Iraq, is the author of the New York Times and international bestselling memoir From Baghdad, With Love: A Marine, the War, and a Dog Named Lava. Since retiring, Jay has become an advocate for veterans and their numerous causes. He currently serves as the executive director of the non-profit agency Freedom Is Not Free. He lives with his family in La Jolla, California.